(Phys.org) -- Aquatic researcher Stephanie Bush has found that one species of squid, Octopoteuthis deletron, is able to jettison part of its arm when either attacking or being attacked. Known as arm autotomy, O. deletron is the only known species of squid able to do so. And as Bush notes in her paper published as part of the Marine Ecology Progress Series, the squid are able to release part of their arm at the point of stress, rather than as octopi do, by releasing their whole leg. Bush writes that she first suspected the squid were able to release parts of their arms when noting several captured specimens had stumps. To learn more, she viewed previously recorded footage of the squid in action then sailed onboard one of Monterey Bay Aquarium Research Institutes submersibles, where a mechanical arm normally used for grabbing things for research was used to prod some of the squid that were found. Initially, the team came up empty, likely because of the slippery character of the metal hand. 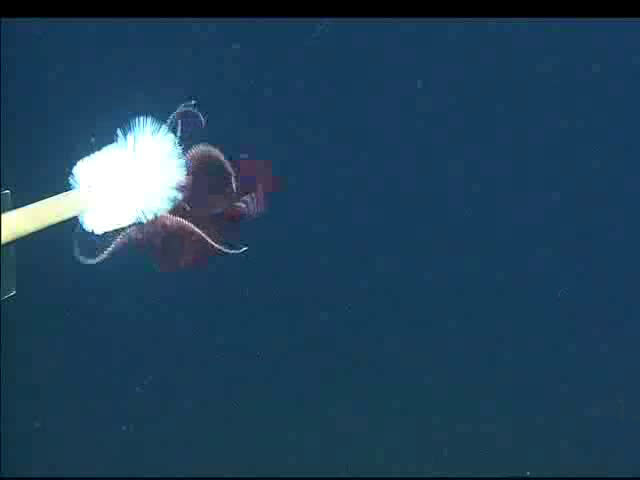 Next, they affixed a bottle brush to the arm and this time after poking some of the squid, causing them to attack, the team witnessed and filmed them detaching arm parts. Bush also brought some specimens into the lab and found that when provoked, seven out of eleven of them broke off arm parts. She also noted that not only were the squid able to let go of arm parts, similar to the way lizards let go of tail parts, but that they did so at the point on their arm that was closest to the object being attacked, thus minimizing tissue loss. 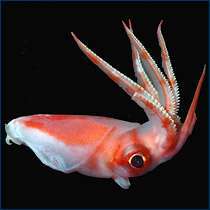 This new finding adds another intriguing feature to the squid, in addition to its ability to squirt ink to create a black cloud allowing it to escape, it also has light emitting organs on the tips of each arm. The lights are thought to distract enemies or prey while the squid either escapes or attacks. The squid are able to regenerate lost arm parts, but Bush notes that it takes awhile, thus it makes sense that they would only break off as much as is needed. She also notes that the arm parts can only be broken off under tension, either by grabbing and holding on to something, or by something grabbing it by one or more of its arms. Remotely operated vehicles (ROVs) were used to observe and collect the mesopelagic squid Octopoteuthis deletron Young, 1972. I documented numerous individuals with shortened, blunt-ended arms and regenerating arm-tips, which may be indicative of arm autotomy, i.e. the jettisoning of a body part as a defense. To test the hypothesis that O. deletron is capable of arm autotomy, laboratory investigations and an in situ experiment using ROVs attempted to induce autotomy. I looked for autotomy fracture planes in histologically sectioned arms. O. deletron is capable of arm autotomy, but it requires traction to occur. O. deletron has numerous places where an arm can sever; arm breakage always occurred immediately proximal to the point of interaction, minimizing tissue loss, and demonstrating economy of autotomy. Despite the fact that this species can autotomize an arm anywhere along its length, only a few well-defined fracture planes were found in our histological sections, indicating that autotomy probably occurs via loss of tensile strength during a defensive interaction. In O. deletron, an autotomized arm usually thrashes and the terminal arm photophore bioluminesceswhether a steady glow, flashing on and off, or bothwhich could be an important part of predator distraction associated with autotomy in dark, mesopelagic waters. O. deletron is the first squid reported to autotomize its arms, the only cephalopod known to be capable of economy of autotomy, and is one of very few species known to use attack autotomy, whereby a predator is grasped by a body part that is subsequently autotomized.